Cylinder contains 5 pounds of copper catalyst capable of removing up to 5 liters of oxygen (13,5000 ppm) and 5 pounds of molecular sieve capable of removing 660 grams of moisture (18 million ppm) with normal oxygen and moisture permeation rates 0.3 ppm/min or lower. Fully factory-regenerated cylinder is ready to use. Isolation valves arrive closed to maintain molecular sieve and copper catalyst capacity. From a 1000 ppm starting condition, able to reduce oxygen to 1 ppm in less than 2 hours. From a 1000 ppm starting condition, able to reduce moisture below 15 ppm in 2 hours, below 10 ppm in 6 hours, below 5 ppm in 16 hours, below 2-3 ppm in 2 days and as low as 1 ppm in 3-6 days. System automatically compensates for power outages and starts the regeneration process over if interrupted for 10 minutes or longer. 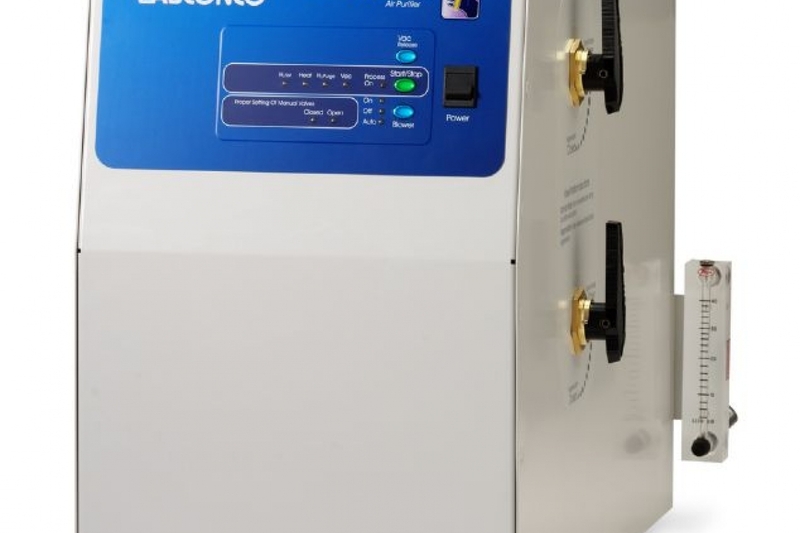 This feature ensures complete regeneration of the copper catalyst and molecular sieve since proper regeneration cannot occur if the system has cooled. Factory leak-tested with a mass spectrometer while pressurized with helium at 5 inches of water gauge. No detectable leaks greater than 1 x 10-6 ml/sec. 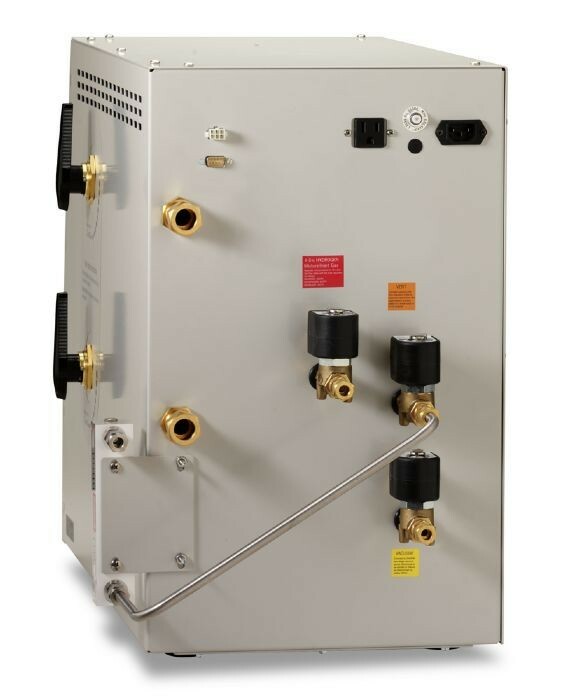 Internal stainless steel gas purification lines have oxygen and moisture permeation below 0.1 ppm/min. 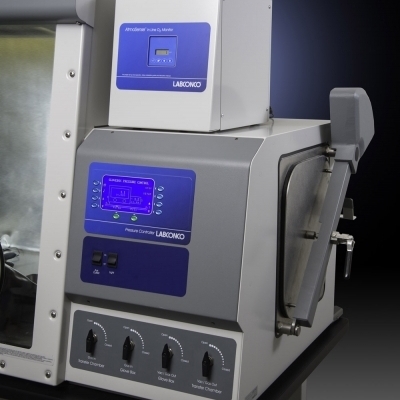 Achieved less than 1.67 ppm/minute oxygen permeation when using ISO 10648-2 test methods at -4 inches of water gauge on Protector Fiberglass and Stainless Steel and Precise Conrolled Atmosphere Glove Boxes. Lowest attainable oxygen levels are 0.2 ppm for stainless steel, 0.4 ppm for fiberglass, and 3.5 ppm for polyethylene. Lowest attainable moisture levels are 1 ppm for stainless steel, 2 ppm for fiberglass and 5 ppm for moisture. Vacuum pump outlet is rated at 115 volts, 6 amps or 230 volts, 4.5 amps. Three microprocessor-controlled solenoid valves, located on the back, for connection to 4% hydrogen/inert gas mixture, vacuum pump and vent exhaust. 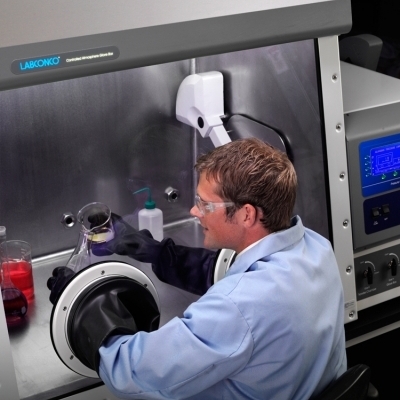 Communications port, located on the back, allows for shared access to the vacuum pump with the glove box. 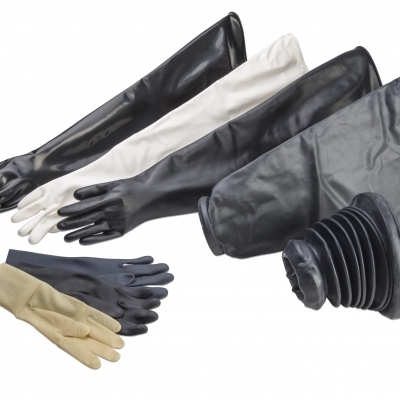 An optional accessory 6-Pin Cable 5442000 is available for communication between the AtmosPure and Auto Pressure Controller of the Protector Controlled Atmosphere Glove Box or accessory Auto Pressure Controller used with the Precise Glove Box. Flow control valve sets 4% hydrogen between 10-25 CFH. Blower button toggles circulation air purifier blower between ON, OFF and AUTO. ON allows the blower to run continuously, OFF shuts the blower off, and AUTO allows the blower to be programmed for auto mode and controlled by the oxygen or moisture control ranges. Start/Stop button initiates and ends the 13 hour regeneration process. 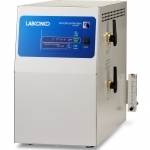 Regeneration heater delivers 180 watts for 5 hours of the 13 hour regeneration cycle. ¾” Inlet/outlet compression fittings for connection to Protector Fiberglass or Stainless Steel Controlled Atmosphere Glove Boxes. 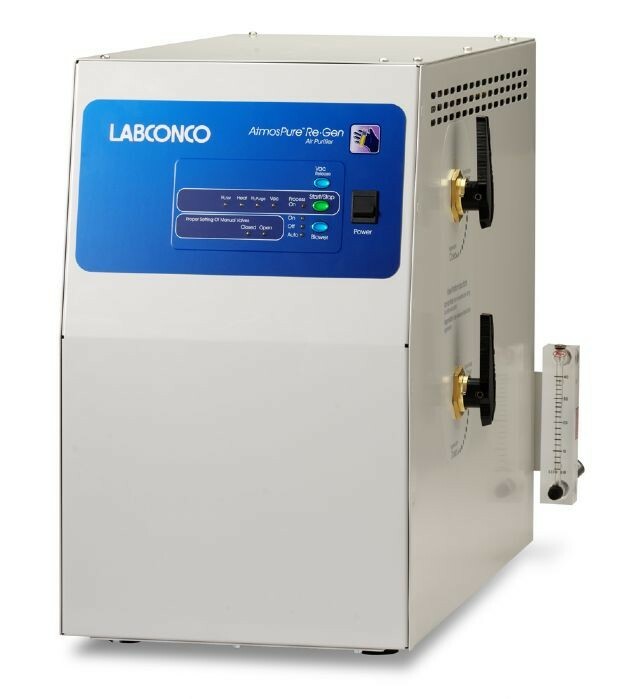 Accessory 3/8” adapter is available for connection to a Precise Controlled Atmosphere Glove Boxes or other glove box models. Compact dimensions. Designed to fit on the accessory Glove Box Base Stand beneath the transfer chamber without interfering with the operator’s leg space. Dimensions: 14.9” w x 31.8” d x 21.9” h (38 x 81 x 56 cm). 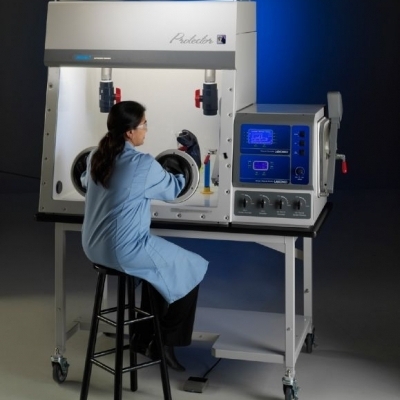 Protector and Precise Controlled Atmosphere Glove Boxes provide a leak-tight inert environment for work with contamination-sensitive materials. 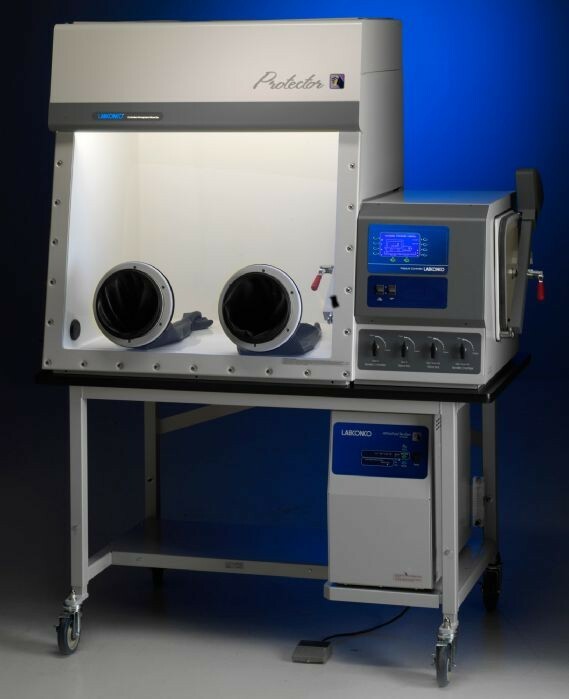 Protector Combination Glove Boxes have the capability to function as either a filtered box or controlled atmosphere box.